What’s a viral video? No mom, the term ‘viral video’ doesn’t refer to those movies my 13 year old brother has recently discovered and started crashing the family computer with. Although, advertisers tend to get just as excited about the potential payoff of a good viral video as 13 year old boys get about the potential payoff of those other videos. Seriously though, a viral video refers to any piece of web-based content that manages to make its way from the creator’s computer into the watercooler conversation at your office. It’s just the web geek term for a big hit that generates a lot of buzz and amasses a larger than average audience. Advertisers love them because they’re the cheapest, and often most effective, form of brand building out there at the moment. And consumers love them because they tend to be some of the more creative, accessible and authentic content out there. Of course, accessible and authentic aren’t exactly words that play nicely with the idea of brand building. Which is why successfully creating and capitalizing on a viral video is truly an art. And, why people like my friend Tyler – who culls the web’s best viral content for Break.c0m – get to earn their paycheck by watching funny videos all day. 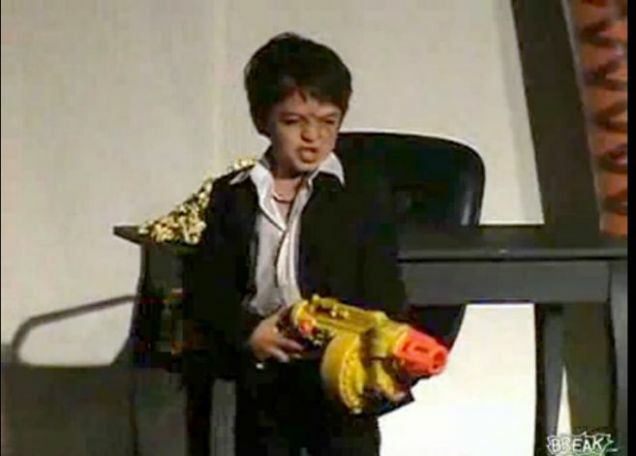 Tyler recently started a blog, and his first entry is a brilliant behind the scenes take on the recent viral smash “Scarface School Play.” It’s well worth a read, whether you’re interested in creating viral vids or just interested in understanding what all the fuss is about (as if the concept of kids reenacting Scarface as their school play leaves any doubt about that). And yes, I managed to get through that entire post without making one joke about saying hello to my little friend. . . This entry was tagged blogging, viral videos, web video. Bookmark the permalink.